Meryl Streep dragged Donald Trump for filth at the Golden Globes Awards. Calling him out for his instinct to lash out at those with less power, like thedisabled New York Times reporter. Then Trump turns around and proves that EVERYTHING she said was true! During the awards show, Meryl won the ‘Cecil B. DeMille Lifetime Achievement Award’. Meryl chose to use her time on stage to draw attention to the divisive attack dog nature of America’s future President. After praising the wonderful and courageous performances by this year’s nominees, Meryl Streep described one performance that “stunned” her. *SPECIAL ANNOUNCEMENT* I’m so excited to share this with you all! Here’s some hilarious items from my new “Gear For The Fearless” online store. 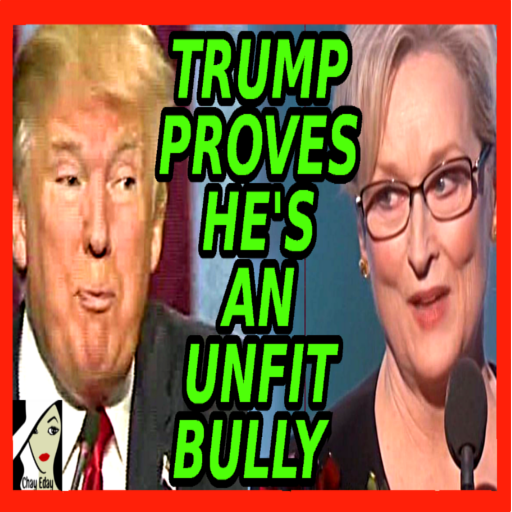 Now watch my video response to that night Donald and also witness the brilliance of Meryl Streep! Also, check out the typically immature Twitter-thugging that we’ve all come to expect from Donald Trump.